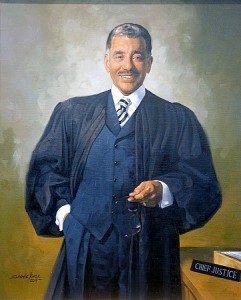 Justice Conrad Mallett, Jr. was appointed to the Supreme Court in 1990 by Gov. James Blanchard (D). He was elected in 1992 and re-elected in 1994. He retired from the Court in 1998. Justice Mallett graduated from the University of California Los Angeles (UCLA), the University of Southern California and the University of Southern California Gould School of Law. He was admitted to practice law in Michigan in 1979 and became the Director of Legislative Affairs for Gov. Blanchard in 1983. He served as the Director and Executive Assistant to Detroit Mayor Coleman Young from 1985-1986.